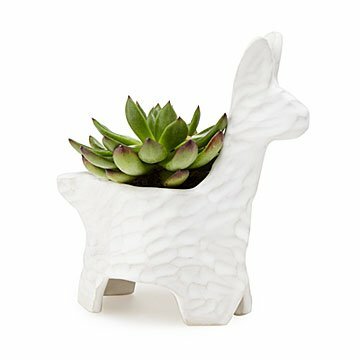 Jo-Anne and Gerald Warren handcraft this adorable stoneware planter, adding a texture to mimic fur. When it's snack time, llamas love to munch on field grass or hay bales. But this adorable grazer is fancy. He prefers succulents, Calla Lilies, or Foxgloves. Keep the sweet planter on your desk or by your bed, simply because it will brighten your day. Jo-Anne and Gerald Warren handcraft the miniature friend from stoneware, adding a playful texture to mimic a llama's fur. A charming gift for animal or nature lovers, we can almost picture the smile on their faces when they open it. Handmade in Ontario, Canada. I purchased this under the impression it included the succulent advertised in the picture. It was meant to be a gift for my mother's birthday. I wanted to get her a succulent in a nice pot, not give her a pot and say "here! plant something in this!". Please be more clear in the photos. This became a very tacky gift. I'm disappointed. My daughter loves it. she put a small plant in it. I'm looking forward to planting a succulent closer to Mother's Day to give to my mom. I know she'll go crazy over this!